Oregon Gov. 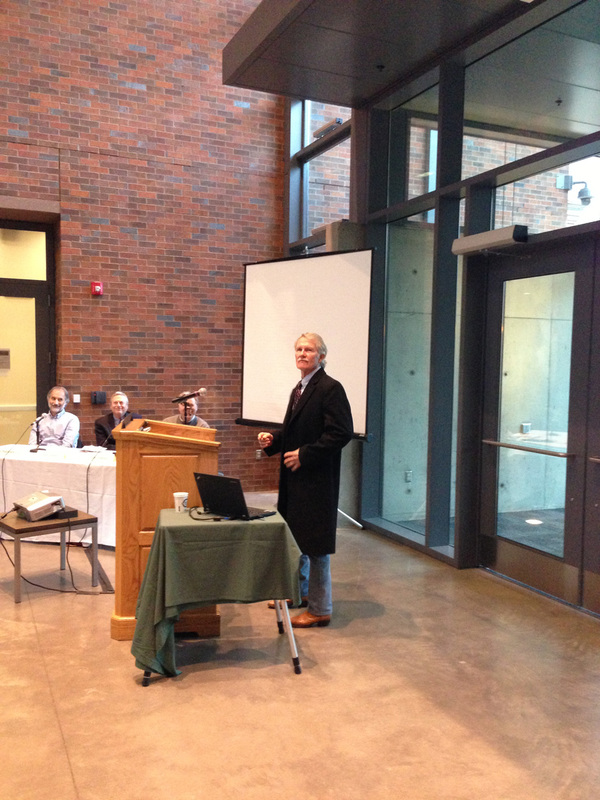 John Kitzhaber attended an economic development forum at the University of Oregon’s new high-tech science facility, the Lewis Integrative Science Building, on Tuesday. In addition to remarks by the governor and officials from the UO and Oregon State University, the event included a panel with the entrepreneurs behind several successful startup companies and featured the unveiling of a proposed South Willamette Valley Technology Business Accelerator concept. The accelerator would be a partnership between the UO and OSU aimed at fostering job creation by advancing the formation, support, growth and retention of technology-based startups. Gottfredson described the proposed new accelerator concept – a joint project of the UO and Oregon State University that will be developed by community agencies, regional cities/counties, private sector partners and the two universities as a part of the South Willamette Valley Regional Solutions Network. The program aims to encourage the translation of innovative ideas from university laboratories into products, companies and jobs. Kimberly Andrews Espy, the UO’s vice president of research and innovation and dean of the graduate school, and Ron Adams, OSU’s executive associate vice president for research, echoed Gottfredson’s comments. Kitzhaber continued the discussion of how to encourage a “knowledge-based economy,” and threw his support behind the accelerator proposal, outlining some of the areas where his proposed state budget may be able to help fund the program. He presented the accelerator program as being in line with his ideas on seeking regional economic solutions to the state’s economic woes. The event also featured a forum led by Nick Fowler, CEO of Perpetua Power Source. The leaders of three successful startups, including Don Upson, CEO of QE Chemicals, spoke about some of the missing ingredients that could lead to the success of more startup companies in Oregon. Upson, whose company licenses the work of UO chemistry professor Shih-Yuan Liu, called for more lab space, seminars and networking events. Mike Marusich, CEO of MAbDx Inc., and Matt Johnen, CEO of ZAPS Technologies, recounted their experiences in getting companies off the ground and talked about how the proposed accelerator program could support future startups. Some of the ideas in the accelerator proposal include the establishment of later-stage development funds for promising companies, the greater availability of small business loans and venture capital funding, and access to affordable office and lab space in close proximity to universities. The accelerator proposal calls for a $10 million capital investment and $2 million in additional state funds.